VPLS has been at the forefront of VMware Cloud Hosting as one of the first VMware certified service providers to achieve vCloud Powered status for enabling both Public and VMware Hybrid Cloud services utilizing vSphere and vCloud Director technologies. Current VMware technology customers can rest assured that their virtual machines are compatible with VPLS Hybrid Cloud services powered by VMware vCloud technology. VPLS’s VMware hybrid cloud platform allows enterprise users the flexibility and security they need. VPLS’ VMware enterprise cloud services helps simplify your consumption of the cloud and transforms your IT infrastructure in radical ways, helping you achieve more business efficiency and address the needs of your customers. VPLS Hybrid Cloud allows you more room for flexibility as it can easily be scaled up and down and use the amount of space in the cloud that you need and pay exactly for it. Once your business demands more of the cloud, you can subscribe for a bigger package or upgrade your existing virtual machines with just a few taps and clicks. All VPLS subscribers, whether public, private, hybrid cloud; dedicated servers or cloud pools are fully backed-up with enterprise grade solutions. VPLS can replicate your files to any of our data centers so you can relax and rest easy whenever the unexpected occurs. 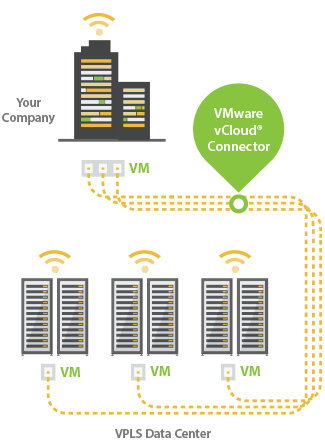 vCloud Connector allows existing VMware vSphere customers to easily consume VPLS Hybrid Cloud services by simply moving workloads to the Cloud from the VMware vSphere client. VPLS Hybrid Cloud connects to your organization’s Private Cloud via secure IPsec VPN tunnels and becomes an extension of your data center so you can start consuming VPLS Cloud Pool resources in both Pay-per-Use or subscription based consumption models. Scale your resources up and down as you see fit with the agility your business desires. Request a demo from a VPLS Cloud Specialist. Whether you are currently using Public or Private Cloud only resources you should always protect your cloud and virtual machine resources with enterprise cloud backup solutions from VPLS. VPLS offers both on premise Disaster Recovery in a Box (DRIB) and Disaster Recovery as a Service solutions that fit all your requirements and budgets. As a Veeam Silver Cloud Provider we use best in class enterprise backup solutions to tackle your problems. For current Nimble Storage SAN customers, VPLS offers completely secure Nimble Storage replication services to the Cloud.